The Emerald Cut has remained of the most popular diamond cuts since the 1920s. Yet, for many, the name of the cut can be confusing — is the diamond green? Are they talking about an emerald or a diamond? What exactly is an emerald cut, and where does it come from? The confusion is natural, considering the cut was originally devised for emeralds, not diamonds. A long-time popular style, the cut originated in the 1500s when lapidaries favored it because the reduced pressure during the cutting process prevents chipping in the gem stone. Because emerald gemstones are particularly soft, this was a huge benefit for cutters. Though it was developed for emeralds, the shape quickly caught on with diamonds and has been a beloved cut for both gems ever since. It is one of the most popular cuts for celebrity engagement rings, with Amal Clooney, Angelina Jolie, and Beyonce all toting hefty emerald cut diamonds on their left hands. Though the cut has been around for centuries, it was not formally christened the “emerald cut” until it rose to popularity in the 1920s with the Art Deco style. Art Deco favors clean lines and symmetry, which emerald cut stones embody to perfection. The emerald cut is a rectangular shape with truncated corners. With a flat surface and 57 facets (typically), the stone looks like a flat platform surrounded by descending steps, leading the cutting process of this gem to be christened “step cutting.” The almost architectural shape fit right into the contemporary style. Whether it be for an emerald or a diamond, the cut is essentially the same in process, but it showcases the stones in different ways. For emerald gemstones, the cut is all about showcasing the color of the stone and allowing the rich, green tones to shine. This does not mean that emeralds are not cut in other ways — the round cut is another popular shape for emeralds, especially when they are used as side gemstones. And like any gemstone, an emerald can be crafted using any of the standard shapes and processes. For diamonds, the emerald cut is a bit more complicated. An emerald cut diamond often has less fire and brilliance than brilliant cuts, but conversely, the broad flat surface highlights the clarity of a diamond and enhances a diamond’s natural rectangular growth and shape. The emerald cut’s flat edges are ideal for those who desire a setting with side gemstones. Most commonly, emerald cut diamonds are flanked by long, thin rectangular diamonds known as baguettes, famously on display in Amal Clooney’s ring. When choosing a diamond with an emerald cut shape, remember that quality is the most important factor, so choose a stone with a high clarity rating and no visible imperfections. Because of the long step-cut facets, the emerald cut does not obscure imperfections in a stone very well. The emerald cut works well with a variety of settings. 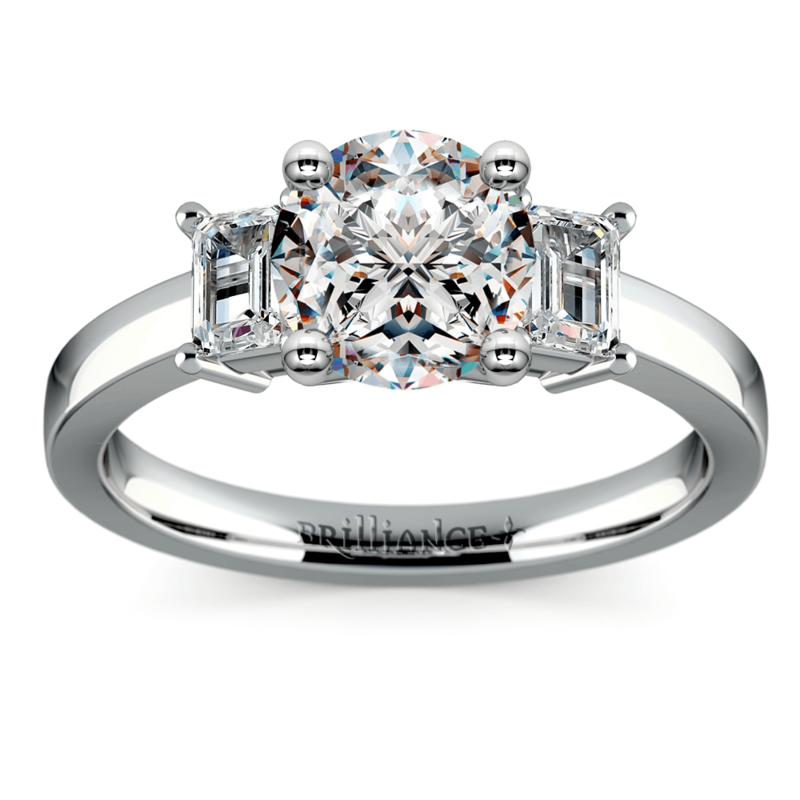 One popular, more contemporary twist on emerald cut stones is to add a halo around the center stone. This helps set off the center stone and adds some extra sparkle. Emerald cut diamonds also make excellent side gemstones themselves, as seen in this Brilliance ring, flanking a center stone of your choosing. Their flat edges make them the perfect cut for pairing, whether they are a side dish or the entrée. Whether you’re choosing an emerald or a diamond, the emerald cut is a sure way to add elegance and extra sparkle to your life.